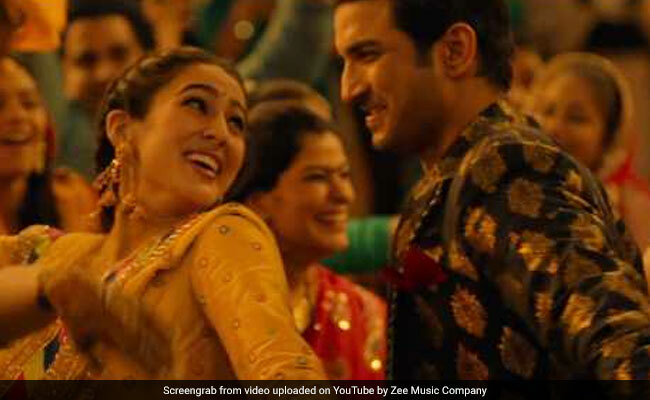 Sweetheart, the new song from Sara Ali Khan and Sushant Singh Rajput's film Kedarnath, released on Thursday. The new song tracks the adorable love story unfolding between Mansoor (Sushanth Singh Rajput) and Mukku (Sara Ali Khan). Sweetheart has been filmed on a wedding like setting and Sushanth and Sara's chemistry in the song is something to look forward to. Sweetheart is a foot tapping number and is sure to way to every party (marriages to be precise) this season. Sara and her first time co-star Sushant Singh Rajput on whom the song is picturised, are undoubtedly the main highlight of the track. Sweetheart has been sung by Dev Negi and the music for the track has been composed by Amit Trivedi. Amitabh Bhattacharya has written the lyrics for Sweetheart. Sara Ali Khan shared BTS photos featuring herself with Sushant Singh Rajput from the song shoot of Sweetheart. On Dhanteras, the makers released the first song from the film titled Namo Namo. Namo Namo is a powerfully-worded track, which embodies the essence of an incantation. The song has over 13 million views on YouTube so far. Kedarnath is a love story set against the backdrop of the devastating Kedarnath floods in 2013. Sara Ali Khan is making her Bollywood debut with the film. Sushant Singh Rajput plays a Muslim pithu (one who carried pilgrims on their back) in the film while Sara plays a Hindu girl who falls in love with him.